Cities conjure a sense of commotion. They can be hives of economic activity and interaction or centres of congestion and crime. Today, the majority of the world’s population lives in urban areas. Before the industrial age, cities as we think of them today were less common. There were hubs for commercial trade and administration, but people resided in rural areas, engaging in subsistence agriculture. Advances in technology from the industrial era created a highly productive sector: manufacturing. Higher paying manufacturing jobs drew labour out of the countryside, and modern cities were born. As they grew, the focus shifted to meeting the needs of modern life: the services sector took centre stage. Cities have tremendous economic potential because they cluster people and activity. Firms and workers can more easily find each other. Transaction costs are lower, with inputs for production never far away. Dense networks spread ideas and technologies, promoting innovation. The outcomes reach beyond economics; the concentration of people allows an inclusive and democratic society to emerge. For a city to blossom these interactions must occur frequently and effectively. The result is higher productivity and a higher quality of life — but only if cities are well-managed. 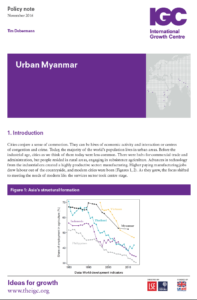 Myanmar’s rapidly growing urban centres makes this a pertinent area for research. Myanmar: A new breed of mobile money?